Whenever I visit my hometown, Cupertino, CA (home of the beloved Macintosh computer), the first thing that I do, before I even go home, is stop off at Sushi Kuni Restaurant. In my five years in NY, I haven’t found a place that compares to the comfort, the authenticity (I hate to say that word, but you know what I mean), the freshness, the consistency, and the value of Sushi Kuni. It’s the REAL DEAL. Truly. 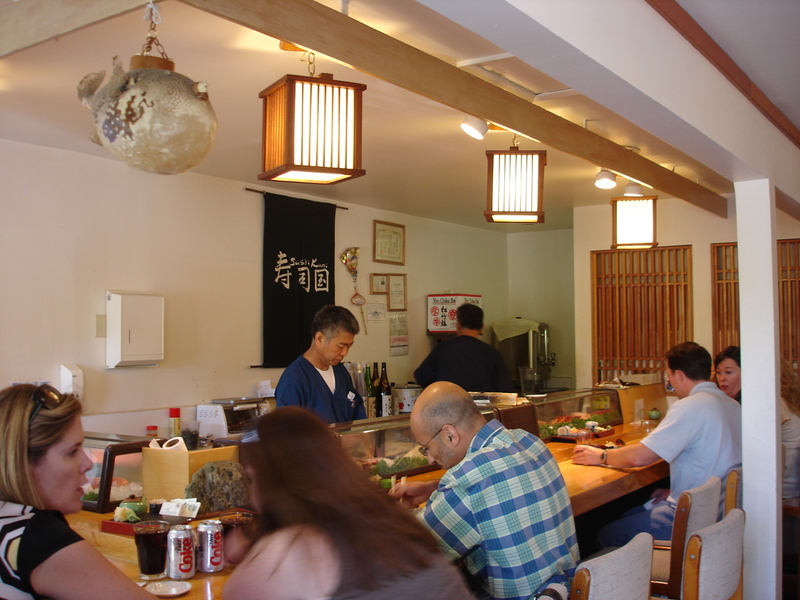 Sushi Kuni opened in 1995, and is located right down the street from Apple HQ. Formerly a little house-turned deli (I heard that the folks at Apple calls this place “the House”), this place only seats 13 people at the sushi bar and has only 7 tables (about 5 years ago they built a tatami room in the back for small parties). I went during lunch two days in a row, and it was pretty packed. 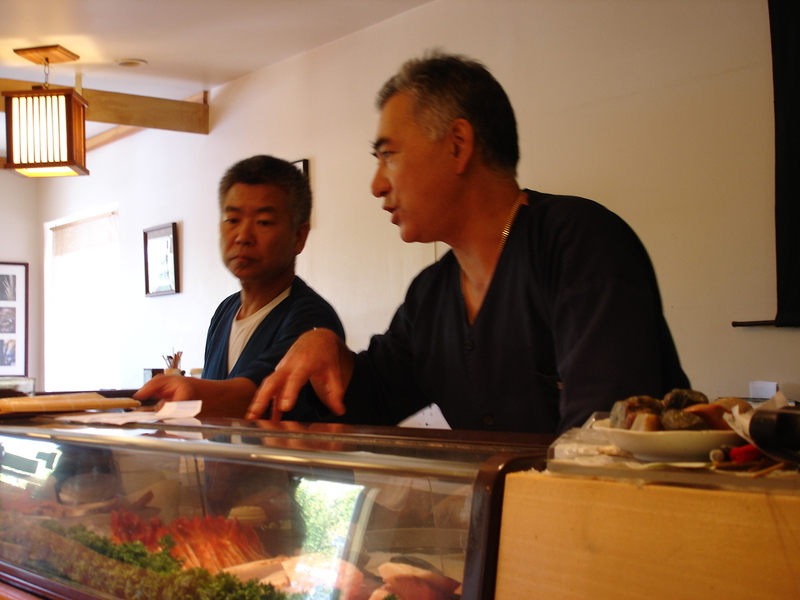 I asked Kuni (founder, proprietor, chef; below left) how business was and he said it’s “too busy.” Ha! It really was though– there were people waiting for a table out front by 12:30pm. Kuni, short for Kunio, is a classically trained tempura chef who worked at one of the most prestigious restaurants in Japan, Inagiku. He was transferred to LA to work for the restaurant there, and pursued a career in sushi when moving to the Bay Area in 1984, when sushi was just barely beginning to make a dent in America’s culinary landscape. Can you imagine life before sushi??? You see, it’s only Kuni and Steve (above right) behind the bar– when it gets really busy, it’s pretty amazing to watch the speed in which they slice the fabulous selection of sashimi to create such colorful, dazzling dishes. But they are never too busy to talk to the customers– they love to chat! Kuni loves to talk about the fish (he always has fish specials that aren’t necessarily on the menu, so make sure to ask what they are)– what region the fish is from, when they are in season, how best they are served. He’s an encyclopedia of fish. Ok so the food: the first thing I ordered was of course the chirashi sushi. 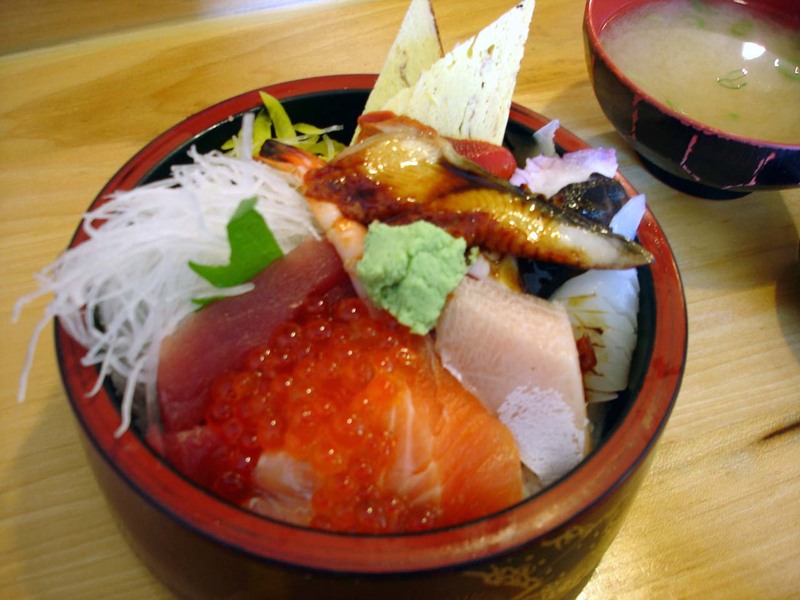 Assorted sashimi over rice– it is always super fresh and truly one of my favorite all-time meals. It’s just so simple and delicious! 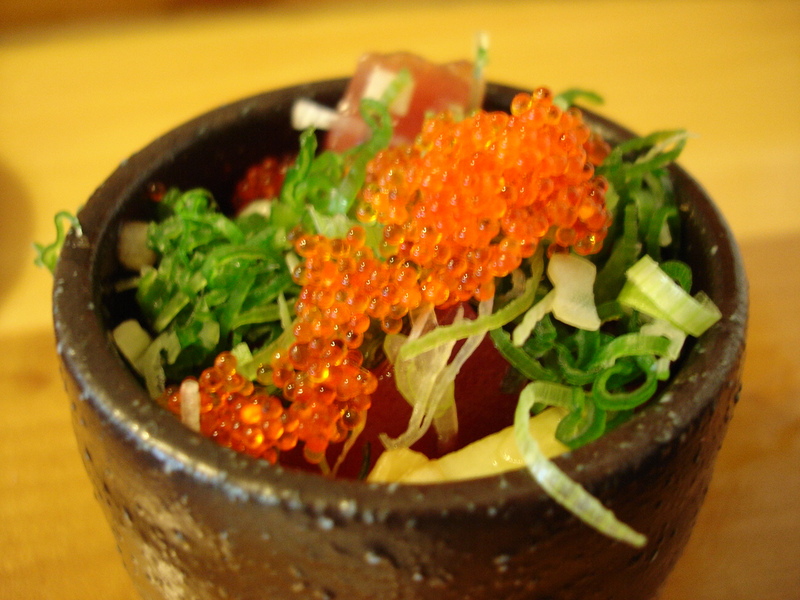 There’s ikura, maguro, hamachi, unagi, ika, tamago, ika, tako, ebi… all over a bed of Kuni’s nicely vinegary (but not too much) rice. It’s genius, if you ask me. With a bowl of miso soup at $13, it’s truly a good deal. Kuni hooked me up with a few pieces of ‘hotaru ika‘ (below), also called ‘firefly squid’, which were on the special menu. 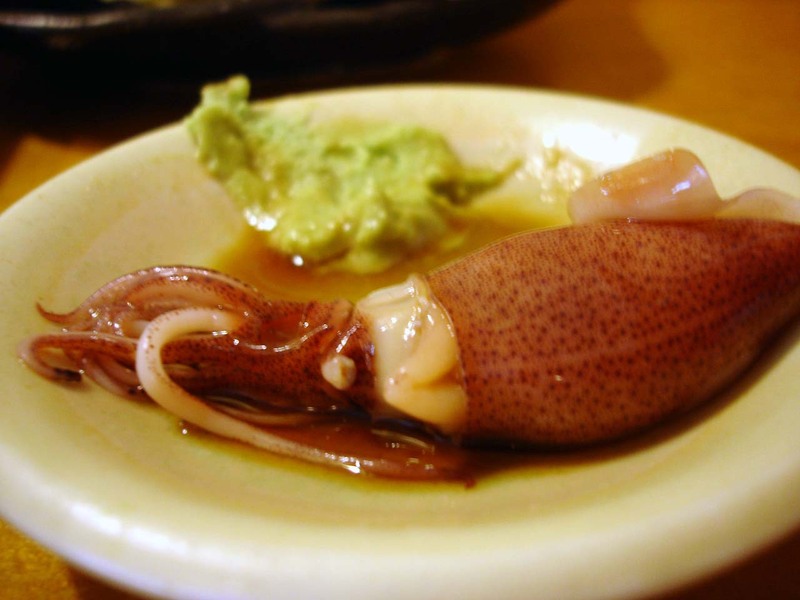 These are tiny little whole squids (only about two inches long), that are slimy goodness very flavorful and truly delicious. I am just reading that they light up blue when migrating in the ocean! If Kuni is the more straightforward, traditional sushi chef, Steve is the funkier counterpart who always brings in new “fusion” creations that are a huge hit with the experimental, cosmopolitan crowd. He used to work at Wolfgang Puck’s place in Vegas, so he’s quite the hipster chef himself. 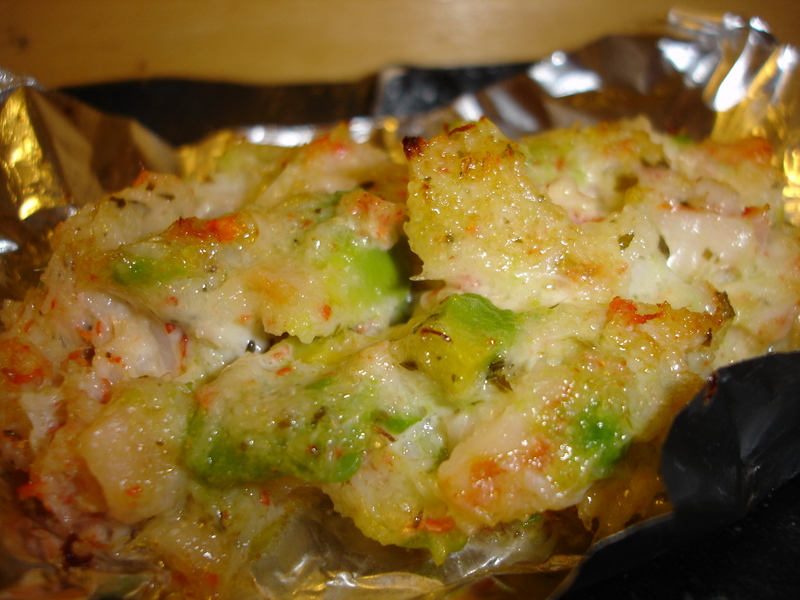 This was avocado, snow crab and shrimp grilled in Steve’s special basil-mayo sauce. Superb! Steve plopped this little cup of delight in front of me as a surprise– it’s his rendition of Hawaii’s poki!!! YUMMY! 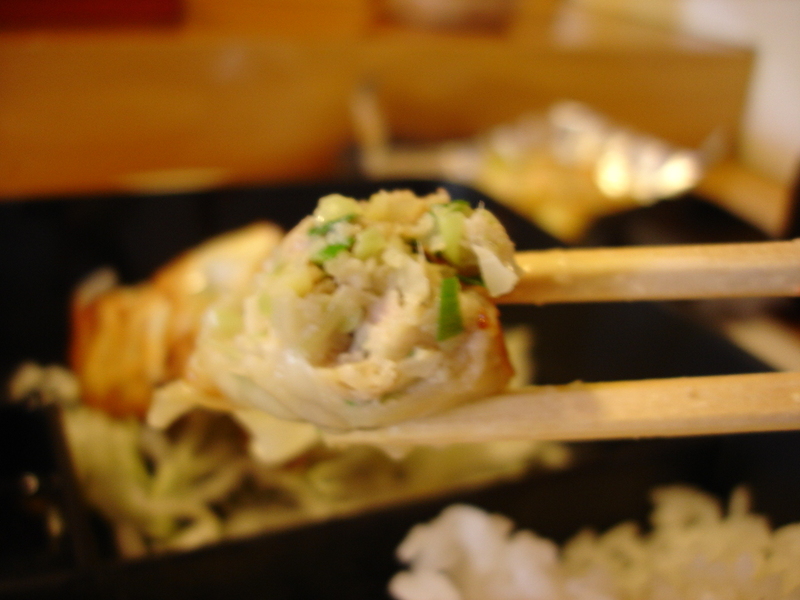 Tuna, scallions and tobiko, in a tangy ponzu sauce. So good! 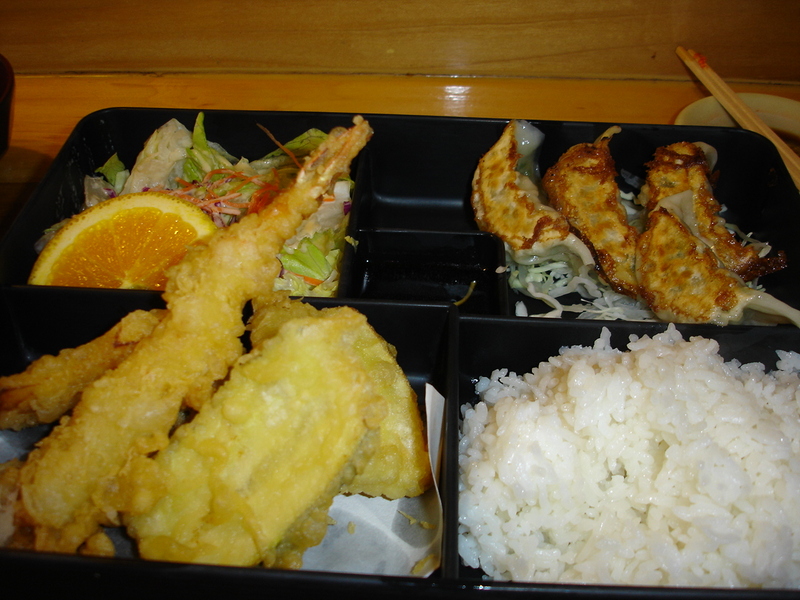 The bento box during lunch is about the cheapest meal you can possibly imagine. For $7.50, you get your choice of two items (tempura, sashimi, sushi, gyoza, and chicken/beef/salmon teriyaki), rice, salad and miso soup. Friggin ridiculous. 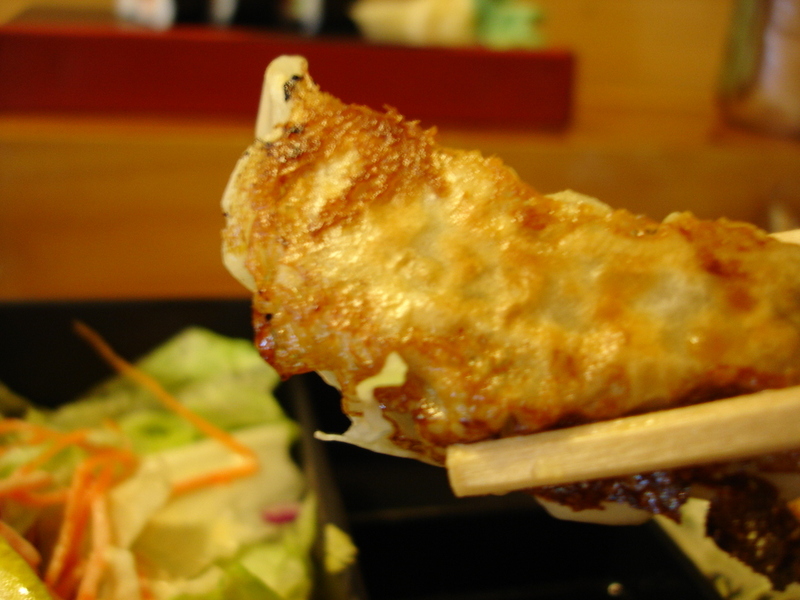 My personal favorites are the pan-fried gyoza (Japanese style pork dumplings) and the tempura– the tempura batter is crispy, never soggy or too eggy, and each delicious gyoza is handmade with love by Sushi Kuni’s other half, Hideko, in the kitchen. 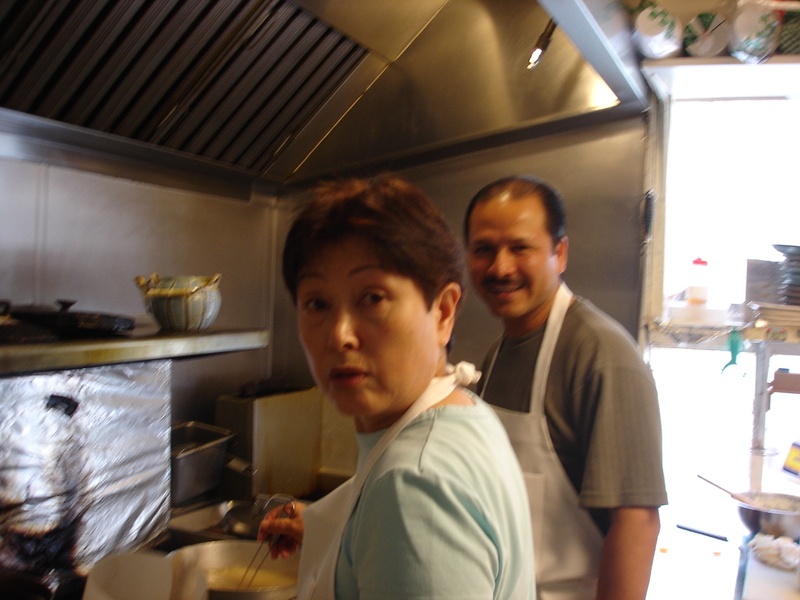 Hideko (below) is Kuni’s wife– she and Victor make everything on the menu that is not done behind the sushi bar. So basically, all the hot food. 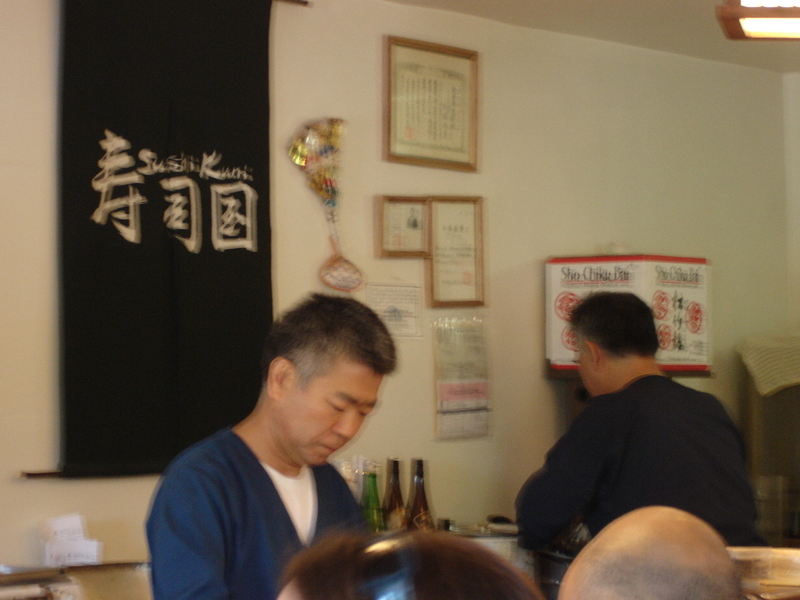 They cook all the Japanese restaurant standards like teriyaki, tempura and nabeyaki udon (another favorite), and Hideko also is the brains behind countless other “authentic” Japanese dishes that are on a seperate, special menu. Little dishes like ‘kinpira gobo’ (sauteed burdock root) and ‘nasu no nanbanzuke’ (eggplant in a vinegar soy sauce) will immediately make you feel like you are hanging out at an izakaya in Tokyo. Incidentally, Kuni also has a license to slice and serve blow fish– I think he told me once that he took the blow fish test at the famed Tsukiji Market in Tokyo. Remember that Simpson’s episode where Homer almost dies when he’s served bad blow fish? 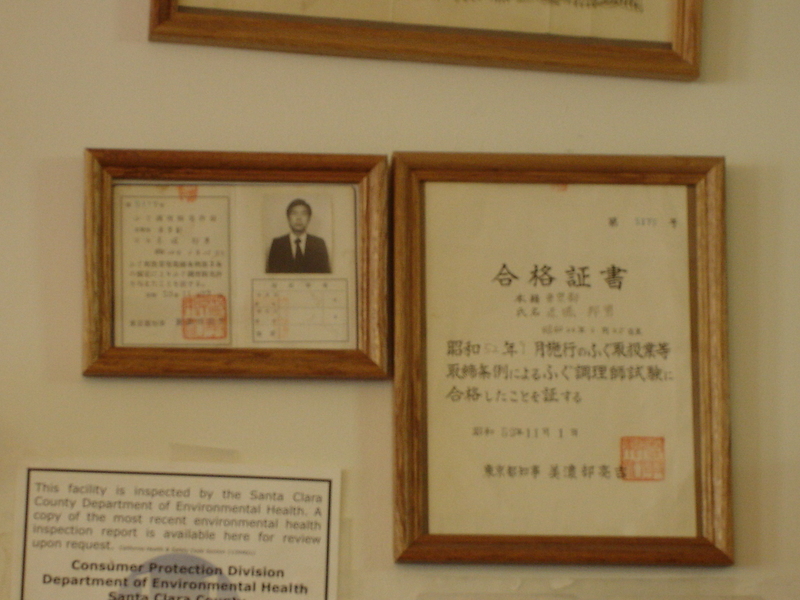 While that episode is not in any way a reflection of Kuni’s mad skills, I always do think of it when I see his certificate on the wall. Hilarious. 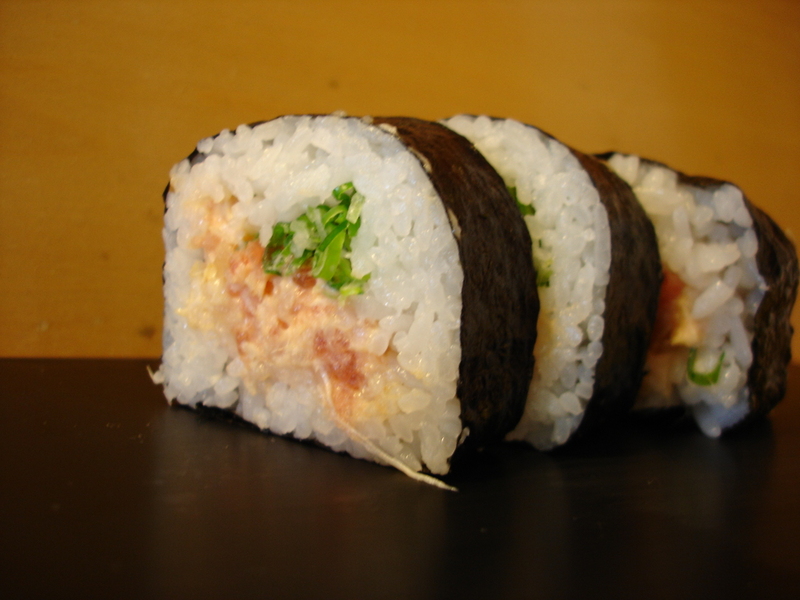 Last but not least, let me comment that Kuni’s spicy tuna roll is the best in the WORLD. My brother and I have had spicy tunas far and wide, and nothing has compared to Kuni’s creation. What could it possibly be? Is it the Kewpie mayo? The green onions? The special spicy sauce? Whatever it may be, it is heavenly. Look, it’s pink! So pretty! 10211 South De Anza Blvd. I have a confession to make: Kuni is also my pops! Biggest shill EVER! I didn’t mean to be tricky, but I didn’t want this to be overtly biased given that this is the family restaurant. But really, I’m not just saying all this because my parents run it– it really is a great little place. He and my mom (Hideko) have poured endless amounts of love, time and energy into Sushi Kuni, and I am so so proud of them both. This is essentially where me and my brother grew up– I was forced to waitress there EVERY SATURDAY NIGHT for ALL FOUR YEARS of high school (you know what that does to a teenage girl who is trying desperately to be cool?? Forget about trying to sneak into San Jose State parties for a night of underage drinking). My brother was forced to work in the kitchen when his delinquency started getting out of hand and my parents thought it would be the best way to keep an eye on him. Oh, and look at us now… Good times. Despite the grueling long hours (he gets in at 10am, and generally doesn’t leave until 1am– but he does get to sneak a nap in there for about an hour), Kuni has a wry sense of humor and has aged little since the restaurant first opened 12 years ago. He also loves a cold glass of beer and is also quite the sake connoisseur so be sure to offer him some of yours when you are sitting at the bar. He’ll drink you under the table. And my mom will drink HIM under the table! Happy Father’s Day とうち!!! You are the BEST! This entry was posted on June 18, 2007 at 2:44 am and is filed under *Kayoko, California, Cupertino, dumplings, Japanese, Restaurant, Sushi. You can follow any responses to this entry through the RSS 2.0 feed. You can leave a response, or trackback from your own site. you can tell it’s good, cuz you can feel the love oozing from the food… i just took a walk in tsukiji on my lunch break and i can tell you my mouth is watering just the same looking at these pics and reading your words. OMG, i had no idea. i have got to figure out a way to get to cupertino!!! awesome post. Why have you kept this a secret all these years? 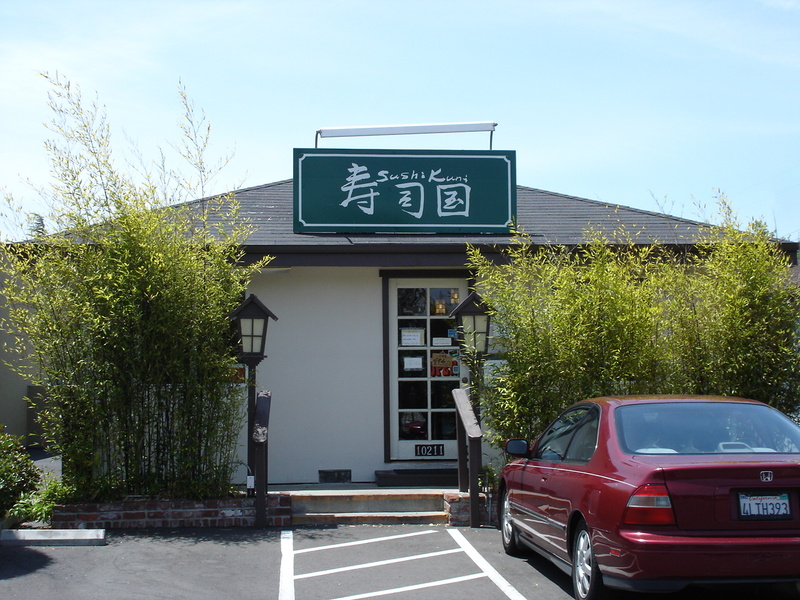 We have been driving all the way to Sushi Maru in Sunnyvale all these years, when we had the best little place in our own backyard!! I am so excited to eat here next time I”m home. my uncle tried to buy that spot when it was a sandwich place back in the early 1990s I think. I can’t believe such good food was right under my nose all this time. I now regret that I spent so much time at armadillo willy’s next door. Yeah, I spent a good amount of time at armadillo willy’s too. I think it’s some weird place called Alotta’s Deli though – the last time I was in Cupertino. I guess “Alotta” is a name although, I couldn’t help think what they were offering “a lot of”. Lovely restaurant, good food. Got this tip from my colleague, definitely a welcome chance from the boring tasteless American restaurant excuses.